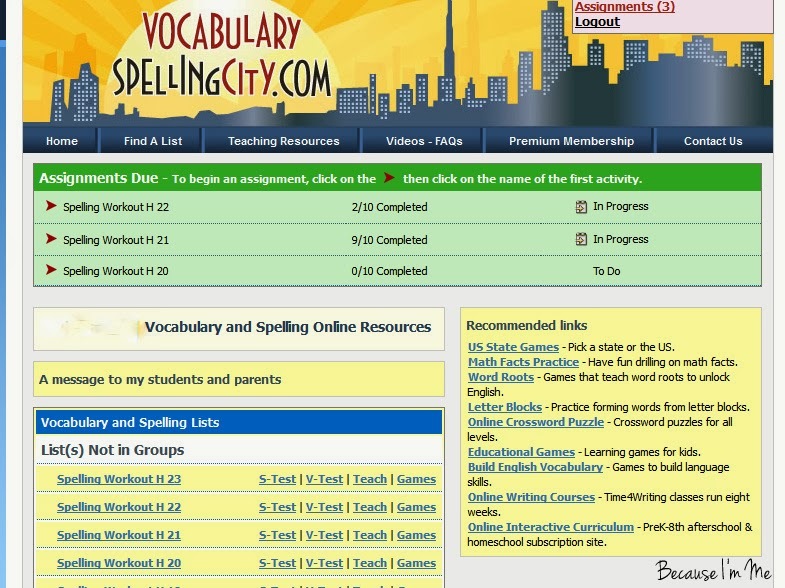 Adam (12) and Kaden (10) recently reviewed VocabularySpellingCity's premium annual membership. VocabularySpellingCity is a website for kids in grades K-12 with games and activities to improve spelling and vocabulary comprehension. We were given a one year membership to the site in exchange for doing this review. While we use this as home schoolers, the site isn't geared just for home schooling. 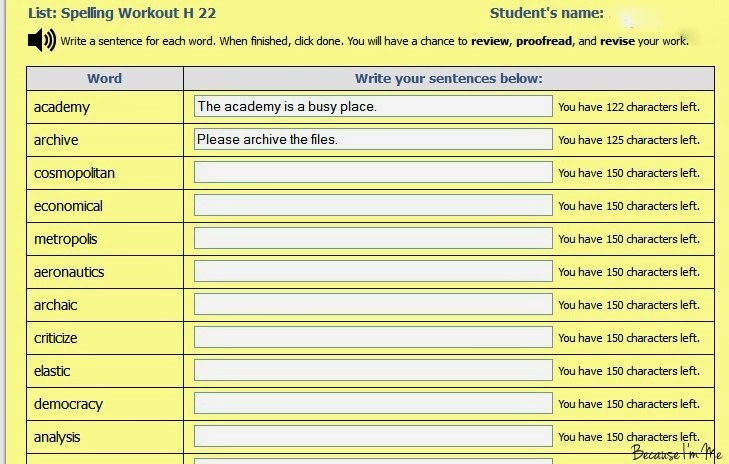 Teachers can create lists for their classrooms, and parents could use the site to create lists to help their kids with their classroom work. 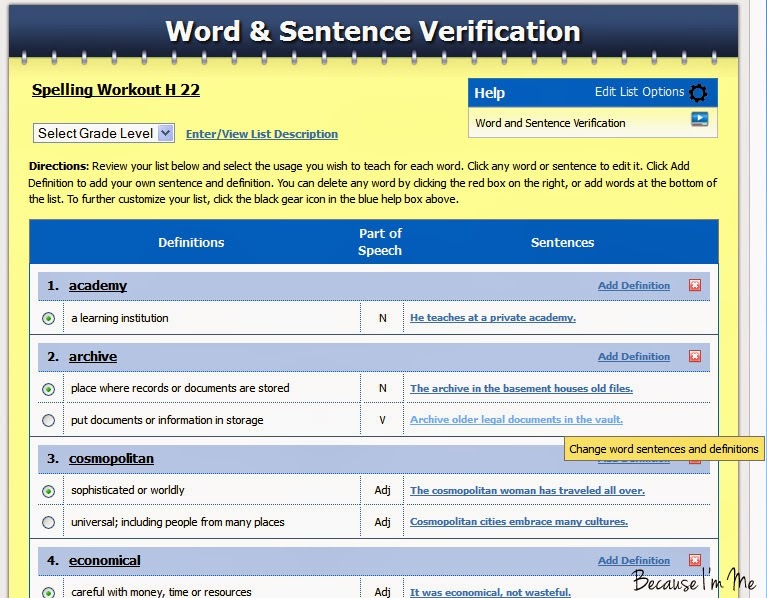 Also, there are lists already created with SAT words, great for high schoolers, and Dolch site words, great for beginning and elementary readers like River. The site provides a database of searchable lists, offering a seemingly infinite possibility of lists to learn. 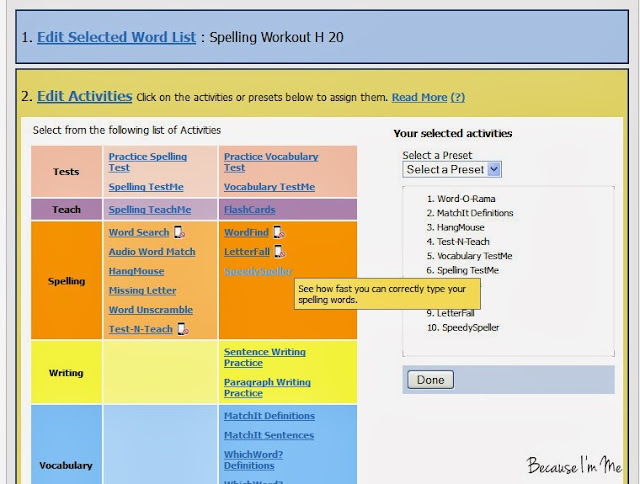 To begin, the site allows the teacher, me, the opportunity to input our current spelling words as a list. After inputting the spelling words I'm able to then choose the vocabulary meaning I'd like for the word (for example, if the word was "duck" I could choose to use the word as a noun, verb, adjective, etc.). 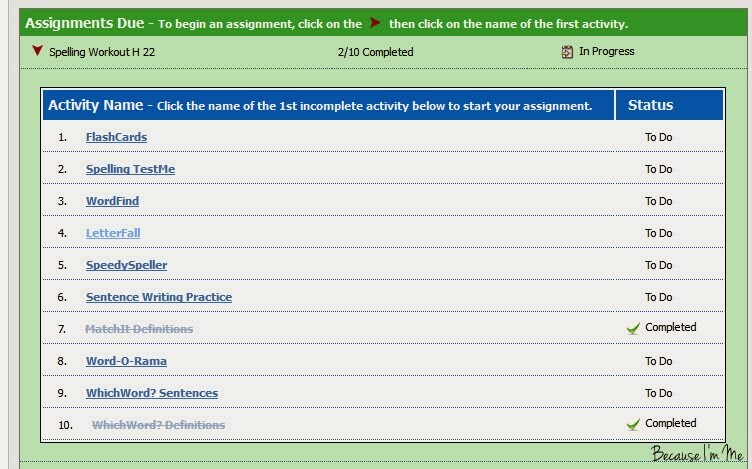 After setting up the list and meanings I can then assign the boys games, tests, and activities for that spelling list. 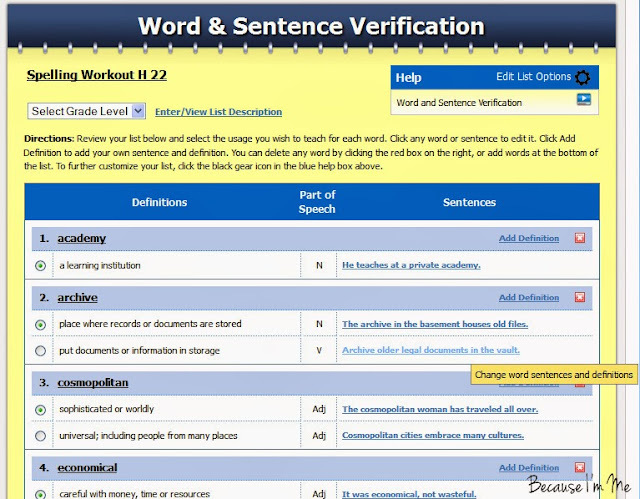 The site tracks their progress and provides scores for completed activities, generating a list of words they got wrong on the spelling and vocabulary tests. Each boy creates his own account and signs himseld in and out. This is a nice feature, as I can then track each of them and they can work at their own paces. The lists I've created and the activities to go with those lists show up when they log in. They just have to click the pre-created links to reach the activities and games assigned to them. Games include Letterfall. 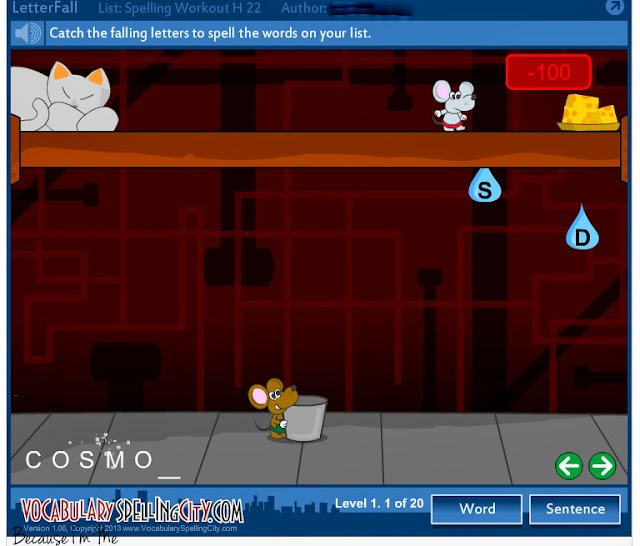 The user has to catch the letters from their spelling word in a bucket. They earn points for catching the right letters, and lose points for missing the letters or catching the wrong ones. Sentence Writing practice, using the spelling list words. 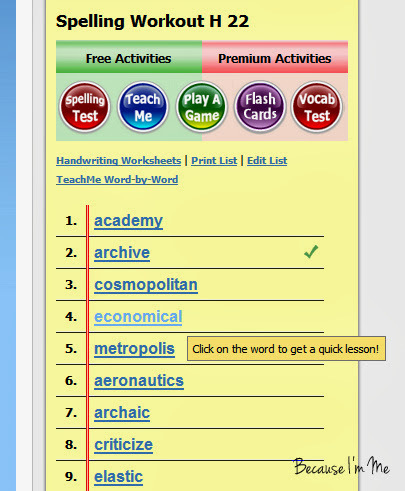 WordFind is my favorite game, creating words, including the list words, from the available letters. I had a very difficult time navigating this site and working my way through it. There are helpful videos to make this process easier, but I still found the site not as easy to maneuver as I'd like. As a busy Mom/teacher/independent businessperson I don't have a lot of time to spend figuring out a website, it needs to be presented to me as clearly as possible. In all honesty, it took me a few weeks to figure out how to add activities to the word lists and I still have to go through a bit of "trial and error" when I want to do something on the site. I am certain I haven't yet achieved the maximum benefit of the site and that there are areas I haven't yet discovered because of the difficultly I've had maneuvering throughout the site. 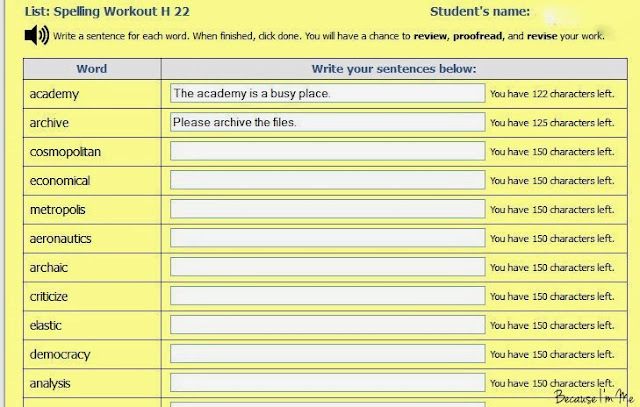 Adam and Kaden liked using VocabularySpellingCity because it's different than their other "sit at the kitchen table" schoolwork. Adam, though, thought some of the games were better for little kids and didn't appeal to him (fortunately, there are many games to choose from so this was an issue that was quickly resolved). The question I have to ask is "Did it benefit Adam and Kaden?" To which I'd answer that yes, it did. 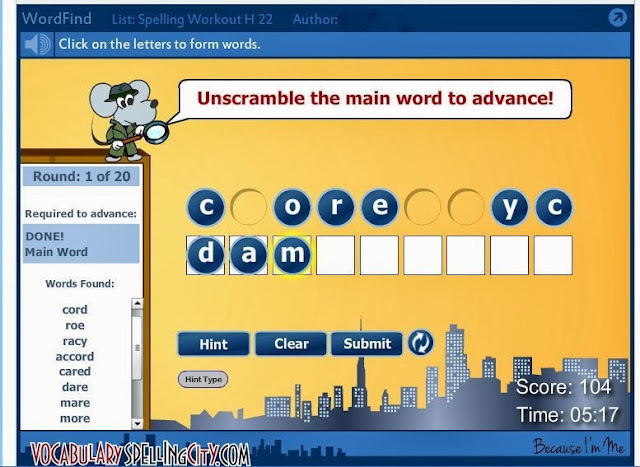 Instead of coming to me for definitions for the words they were able to find them themselves, which improved their scores on that portion of their spelling worksheets. There are also fewer spelling errors in their work. We haven't achieved perfection, but fewer errors with words like synagogue, incognito, exorbitant, and aeronautics is fine with me. VocabularlySpellingCity.com's premium membership is available for $29.99 per year for a family with up to five students, each with their own account. The site is recommended for ages 5-18.